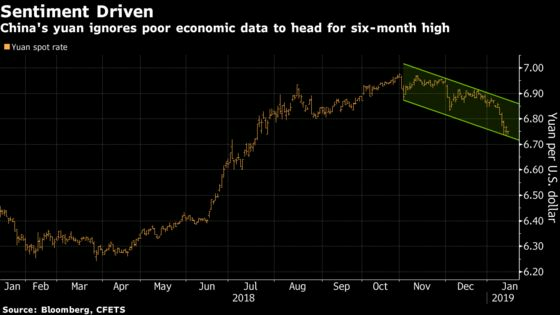 (Bloomberg) -- China’s yuan is shrugging off poor economic data to head for its strongest level in six months, but the gains are coming so fast they’re casting uncertainty over the rally’s longevity. The currency rose as much as 0.42 percent to 6.7383 per dollar Tuesday, in line for its highest close since July. It has rallied 1.8 percent this year, the third-best performer out of 11 Asian exchange rates tracked by Bloomberg. The advance comes amid a string of worse-than-expected economic numbers, spurring warnings from the likes of Mizuho Bank Ltd. and Rabobank Group that a correction could be on the horizon. China’s exports in dollar terms fell 4.4 percent in December from a year earlier and imports slumped 7.6 percent, the worst readings since 2016. Data on industrial profits, manufacturing, retail sales and producer prices have also been soft, adding to signs that fundamentals surrounding the Chinese economy have yet to respond to policy makers’ efforts to shore up demand. The onshore yuan pared its gain to 0.15 percent as of 5:17 p.m. trading at 6.7568 per dollar in Shanghai. The offshore rate was down 0.06 percent.